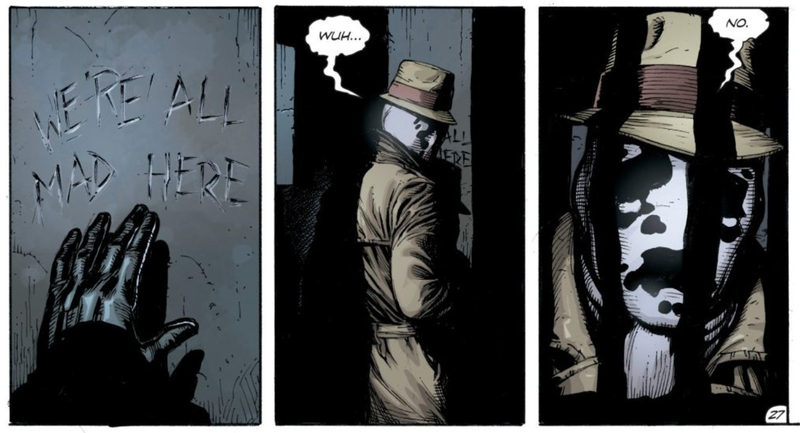 Doomsday Clock’s Rorscach, as seen in issue three. Doomsday Clock is the slowest of slow burns. Its biggest mysteries—like just where Dr. Manhattan is in the DC Universe, or how the hell a mime can mime himself a lethal weapon—still remain barely explored, let alone solved. But it’s finally started to lift the lid on one of its most intriguing additions: the new person underneath Rorschach’s mask. The parallels between Geoff Johns, Gary Frank, and Brad Anderson’s Doomsday Clock and its legendary predecessor Watchmen mean that having a new, African American Rorschach as the driving heart of the new series should be no surprise, given Walter Kovacs’ central role in the original. But over the course of the first three issues, the character’s lack of connection to the original Watchmen, both the team and the graphic novel, has made this Rorschach feel somewhat untethered from the story, even though he’s clearly representing something unknown. Rorschach skulking around at the end of the world in Doomsday Clock’s first issue. Yes, he’s skulked around the same jacket and mask as Kovacs, and yes he gets looped into Ozmandiyas/Adrian Veidt’s plans to find Dr. Manhattan and stop the world from ending itself again. But he’s been a certain distance removed, an outsider looking in on the ramifications and fallout of a series we know more intimately at this point than Kovacs had been. But finally, the fourth and latest issue of Doomsday Clock has identified the person who has taken the shifting mask of the vigilante, and revealed the character has a much deeper and in many ways more tragic connection to the original series than anyone suspected. While the previous issues hinted at a fascinating backstory for the new Rorschach—one of the thousands who survived Veidt’s psychic monster attack on New York, irrevocably mentally scarred instead of killed in an instant—Doomsday Clock #4, mostly told through flashback, reveals his life before that moment. The new Rorschach is a young man named Reggie Long, and he’s the son of Dr. Malcolm Long. Yes, that Dr. Long. Dr. Malcolm Long meets Walter Kovacs in Watchmen #6. That should be a familiar name to fans of the original series. Dr. Long plays a small yet crucial role in Watchmen, specifically in the sixth issue, when he is called in to psychologically evaluate Kovacs while he’s incarcerated at Sing Sing. In the original Watchmen, we see Dr. Long and his wife Gloria as Long becomes steadily more and more engrossed in his attempts to help Kovacs, and ultimately finds his worldview changed by the awful story of how Kovacs became Rorschach in the first place. We see the couple again in Watchmen #11, as immediate victims of the arrival of Veidt’s psychic alien in New York. But what Doomsday Clock adds to Watchmen and the Longs’ story is that they had a son, Reggie, an only child who at the time of Watchmen’s events was away at college. A younger Reggie Long and his frazzled parents in Doomsday Clock #4. When tensions between the US and the Soviets rose to a fever pitch, Reggie returned to New York to be with his family (he didn’t know that his parents’ relationship had broken down after his father’s encounters with Kovacs) in case nuclear war actually broke out—only to be on the edges of the city stuck in traffic when Veidt’s monster attacked. He was far enough away to not be brutally slaughtered by its screams, but close enough to be driven insane by its psychic death throes and grimly committed to Fitzgerald Mental Home. Doomsday Clock #4 ties Reggie into Watchmen’s legacy of costumed heroes beyond his father. One of his fellow inmates at Fitzgerald is actually Byron Lewis, formerly the hero Mothman, and a member of the Minutemen briefly featured in the original comics. Committed to Fitzgerald after years of alcohol and drug abuse caused by the pain of his vigilante work, Byron becomes close friends with Reggie, and uses his rebuilt Mothman wings to occasionally break out of the institute and smuggle in contraband for the two—including Dr. Long’s files, full of notes about Kovacs. Byron even starts teaching Reggie how to fight, using techniques he learned during his time in the Minutemen. Bryon Lewis befriends Reggie in Doomsday Clock #4. But it’s Dr. Long’s files that really set Reggie on the path to becoming Rorschach. As the revelation that Veidt created the psychic monster that annihilated New York City eventually became public, Reggie finds himself, like his father before him, enthralled by Kovacs’ worldview. It’s another parallel to the original series, but with a twist: While Dr. Long found himself leaning to Kovacs’ lonely, fatalist worldview after their encounter, his son picks up on Kovacs’ rage, as it’s so similar to the one already brewing inside him. It causes him to target Veidt, the man he now knows is responsible for his parents’ death. Escaping Fitzgerald on a mission of vengeance, and now armed with Rorschach’s mask and his stilted, murmured manner of speaking as a symbolic continuation of Kovacs’ anger at the world, Reggie made his way to Antarctica to kill the now-globally-reviled Veidt... only to find that he can’t bring himself to do it. That’s because the Veidt he finds is not the Veidt he had angrily imagined in the time he spent at Fitzgerald, but a man haunted by his misguided attempts to save the world—and a man, as previously revealed, slowly dying from cancer. For all the connections he has to the original Watchmen story, the profound difference between Reggie and Kovacs in the end is that even with all he’s gone through, Reggie still has a broader view of morality that has more to it Kovacs’s extreme dichotomy of either wholly good or wholly evil. Like Dr. Long before him, deep down under the layers of trauma Reggie knows that anyone who does wrong can still be capable of redemption. And so the villain he became obsessed with killing became the man he begrudgingly worked with to try and stop the world from ending all over again. Reggie fails to stop Veidt once and for all, just as Walter Kovacs did before him. There’s a dramatic irony in the fact that a man who is now so intimately familiar with the truth of what Adrian Veidt did in the climax of Watchmen—the truth that Walter Kovacs was so unprepared to hide from the world he asked to die instead of keep it a secret—is now working with him to try and prevent another apocalyptic event befalling Watchmen’s world. Time will tell what comes of their relationship; after all, there’s still another eight issues of Doomsday Clock to go. But already, even in a world of supernaturally deadly mimes and nuclear war, the reforging of the broken man behind Rorschach’s mask is one of the most enthralling aspects of the series.